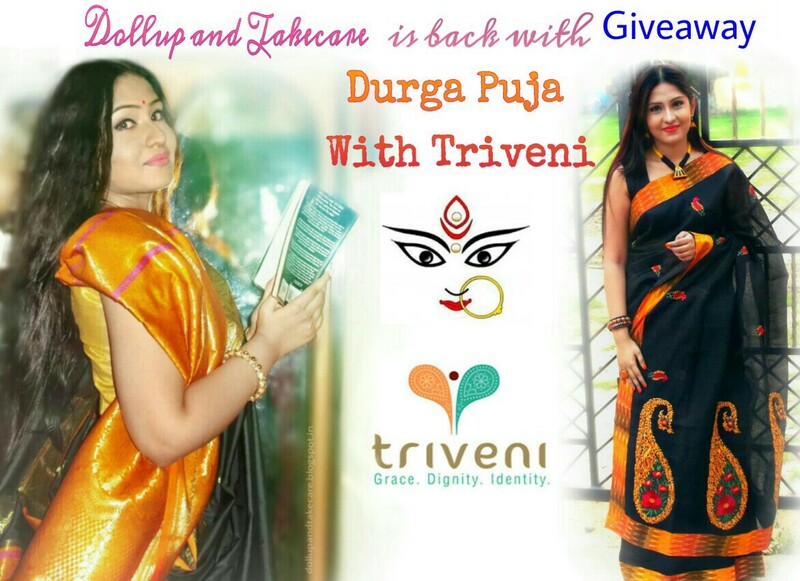 Hi friends I am back with a Giveaway in association with Triveni Ethnics . As you all know the season of mists and mellow fruitfulness arrives in our country with the essence of celebration .This festive season is celebrated as navaratri in India and In West Bengal this festival is called “Durga Puja”. Durga Puja is the biggest festival of Bengal and is highly attached to the sentiments ,culture and tradition of people of bengal. This is the festival of home-coming, festival of spreading love .So Dollup and Take Care and Triveni Ethnics spreads love for our lovely readers . 3 of you can win sarees from Triveni . Contest starts on 1st oct 2016 ends on 9th oct 2016. 1.Firstly if you are a follower of my blog you can participate. You can participate on both Instagram and Facebook. You should like the Facebook Page of Triveni Ethnics and Dollup and Take Care. 2. Share the giveaway picture on your timeline(Facebook) and tag 9 (minimum) friends in the comment section of the giveaway post.If you are participating from instagram repost the image and tag me and Triveni and invite 9 friends in the comment section of my giveaway post. 4. Winners will be chosen through lucky draw .Make sure you follow all the rules mentioned above to get your entry counted. So Wishing good luck to all my lovely friends .. have a prosperous and Joyfull Durga Puja .